How well any specific ETF fits into a portfolio — and to what degree it affects the risk of a portfolio — depends on what else is in the portfolio. This concept is called Modern Portfolio Theory and is a tool you can use to determine a proper ETF mix for your portfolio. The theory says is that the volatility/risk of a portfolio may differ dramatically from the volatility/risk of the portfolio’s components. In other words, you can have two assets with both high standard deviations and high potential returns, but when combined they give you a portfolio with modest standard deviation but the same high potential return. Modern Portfolio Theory says that you can have a slew of risky ingredients, but if you throw them together into a big bowl, the entire soup may actually splash around very little. The key to whipping up such pleasant combinations is to find two or more holdings that do not move in synch: One tends to go up while the other goes down (although both holdings, in the long run, will see an upward trajectory). Hypothetical ETF A and hypothetical ETF B, each of which has high return and high volatility. 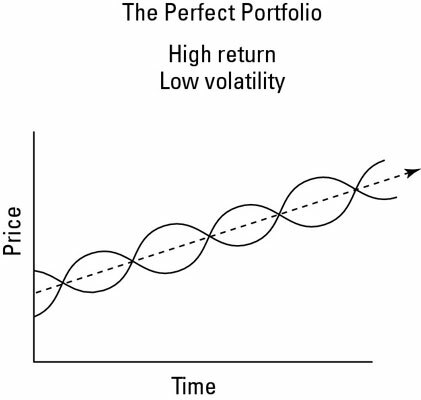 Notice that even though both are volatile assets, they move up and down at different times. This fact is crucial because combining them can give you a nonvolatile portfolio. ETFs A and B each have high return and high volatility. The perfect ETF portfolio, with high return and no volatility. When the U.S. stock market takes a punch, which happens on average every three years or so, most U.S. stocks fall. When the market flies, most stocks fly. Not many investments regularly move in opposite directions. We do, however, find investments that tend to move independently of each other much of the time, or at least they don’t move in the same direction all the time. In investment-speak, these investments have limited or low correlation. Different kinds of stocks — large, small, value, and growth — tend to have limited correlation. U.S. stocks and foreign stocks tend to have even less correlation; see the sidebar “Investing around the world.” But the lowest correlation around is between stocks and bonds, which historically have had almost no correlation. Say, for example, you had a basket of large U.S. stocks in 1929, at the onset of the Great Depression. You would have seen your portfolio lose nearly a quarter of its value every year for the next four years. Ouch! If, however, you were holding high-quality, long-term bonds during that same period, at least that side of your portfolio would have grown by a respectable 5 percent a year. During the market spiral of 2008, there was an unprecedented chorus-line effect in which nearly all stocks — value, growth, large, small, U.S., and foreign — moved in the same direction: down . . . depressingly down. At the same time, all but the highest quality bonds took a beating as well. But once again, portfolio protection came in the form of long-term U.S. government bonds, which rose by about 26 percent in value.